This year we planted two strawberry plants – two different species. This is the first of the crop. JJ picked when we got home this evening and I rinsed it, took too long trying to take a photo with my macro setting. I then cut it in half and we ate it. It was scrumptious. 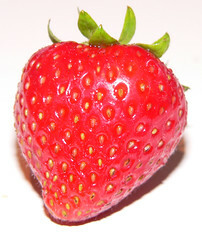 Some strawberries I buy from the fruit and vegetable shop are really hard and woody and have no taste. This was nothing like that. I look forward to eating more – hopefully before the birds get them.